The Ireland international partially atoned for his error in the dying stages, however, as he cleared a Benteke attempt off the line. NEWCASTLE WERE LEFT frustrated after having to settle for a 1-1 draw with Crystal Palace at Selhurst Park in the Premier League today. Mohamed Diamé gave the Magpies a first-half lead with a goal on 22 minutes. However, Rafa Benitez’s side were punished 10 minutes after the break, as Luka Milivojević equalised from the penalty spot, after Ciaran Clark had been penalised for a needless jersey tug on Christian Benteke. The Irish international partially atoned for his error in the dying stages, however, as he cleared a Benteke attempt off the line. The Magpies are only one point above the relegation zone in 16th place after failing to win for a fourth consecutive league match. Palace, without a win in their last three league games, are two points ahead of Newcastle. The visitors had gone in front in the 22nd minute. Kenedy swung a low delivery into the penalty area that Milivojevic missed and when Martin Kelly failed to track Diame’s run, the Senegal midfielder was free to finish from close-range. But Newcastle defender Clark conceded a 55th minute penalty when he bundled over Christian Benteke after the striker leaped to reach Wilfried Zaha’s cross. 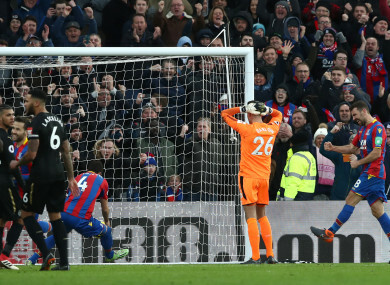 Serbian midfielder Milivojevic sent his spot-kick towards the bottom corner and although Karl Darlow got a hand to the ball, he was unable to prevent it reaching the back of the net. Newcastle’s Jonjo Shelvey was fortunate not to concede another penalty for a blatant tug on James McArthur’s shirt as the Magpies held on. Email “Irish defender Clark punished as Newcastle forced to settle for point”. Feedback on “Irish defender Clark punished as Newcastle forced to settle for point”.